The teams final score placed us 41st of 112 teams. We are excited to have had such strong early season performances in our first trip to Collegiate Club Nationals, and we are looking forward to the rest of the season. Be sure to check out some of our photos below, and the official USA Triathlon highlights video. The Wildflower squad enjoying the atmosphere after the finish! From left to right: Jason Klein, Erik Larson, Nick Barclay, Teresa Wang, Tim Durham, Bri Troksa, and Courtney Klein. Seven of our athletes raced at the Wildflower Triathlon Festival, competing in the Collegiate Championships and Road Sprint. Husky Triathletes with their Running Club compatriots after some speedy track racing! 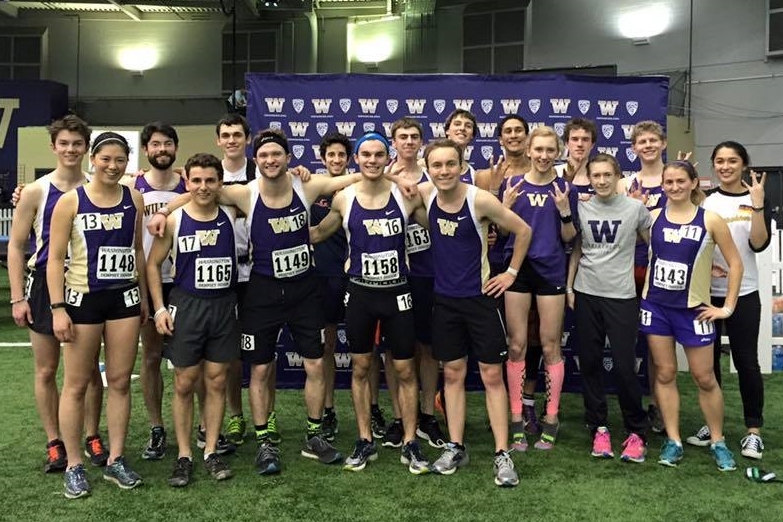 Husky Triathletes join the Running Club for the 2016 Husky Classic Club Mile race! Background image by Katherine B. Turner, UW.